"No"... and there is no such thing as "Government provided Free Universial Health Care." It is paid for by someone, most likely by those you politically oppose. Entitlements already take up a huge percentage of the budget as is, are politically almost untouchable, and pretty much are all in need of reform anyway. In a time in which we should be reducing government spending and increasing tax revenues to have some prayer of a balanced budget without relying on China and the printing machines, implementing Universal Health Care... now... would be a total disaster. We are already headed for fiscal disaster few if any of you are prepared for, "free" Universal Health Care would just accelerate the process. But anyways, like when they say that "we currently have a free-market health-care system," they're talking out their asses. Our health-care system is run by the already-successful, and the already-successful have no interest in maintaining a free market; they would rather have the government come in and clamp down on competition in various ways to insulate them from challengers. There is too much market power in the hands of too few competitors in a non-competitive market. This is the real problem with the system as it stands, and I don't see how having an even more centralized system will work better. Well....the successful should be the principle influence in a free market. It doesn't make a whole lot of sense to take your cues from the unsuccessful ones!! Other than that....you're spot on. The combination of the HUGE influence of Medicare and the fact that State regulation forces everyone to provide an essentially uniform product severely limits competition. It's like somewhere along the line someone decided that 10 people all doing the same thing equates to competition whereas true competition requires all participants to be more or less doing their own thing but with a common goal. Gotta go with "no" as well. Especially at the national level. 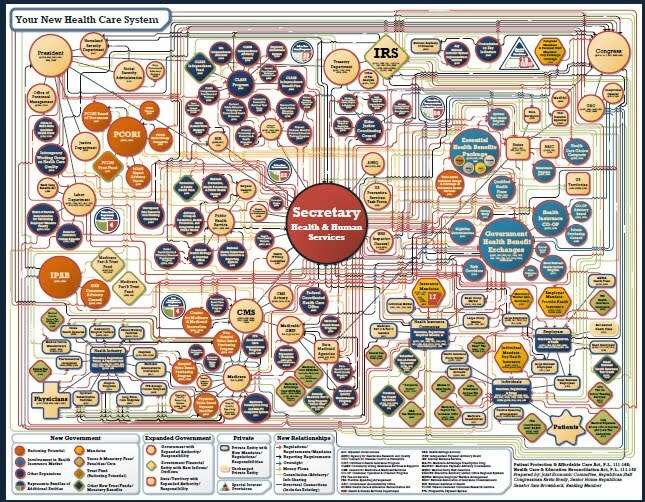 I see far more risk than benefit in creating a nexus of control over something as fundamental to our lives as health care. I can't imagine how it would not become heavily politicized and heavily lobbied by everyone who stands to make a buck off of it. I don't want to see federal control over our health care any more than I'd want to see them in control of our food supply. If we must indulge a dependency on government for health care, we should do so at the local level. Something like what we do with public primary education would be far better than a monolithic system that will inevitably become a prime target of the corporatists. As secondary consideration, but not an insignificant one, I have serious concerns about how making health a public responsibility will effect the regulatory landscape. Even with the limited government involvement in paying for health care, we are already seeing public health expenses used as justification for laws that seek to micromanage our lives, enforcing the state's idea of good health habits and punishing those who don't comply. Nationalizing health care will only accelerate the trend and provide ample excuse to those who seek to use the state as a way to force their idea of the "good life" on everyone else. When you compare the price we pay per capita for healthcare to the price paid in other nations, nations that have better healthcare services than we do, I don't think you can support that statement without showing blatant and willful disregard for the health and well-being of the millions of Americans who do not have health insurance from their jobs. To say that "competition" is worth the price we pay for it means that you must think very little of the price those Americans are paying. "No"... and there is no such thing as "Government provided Free Universial Health Care." It is paid for by someone, most likely by those you politically oppose. Is this another one of those idiotic assertions that only conservatives pay taxes and only liberals receive welfare? Entitlements already take up a huge percentage of the budget as is, are politically almost untouchable, and pretty much are all in need of reform anyway. In a time in which we should be reducing government spending and increasing tax revenues to have some prayer of a balanced budget without relying on China and the printing machines, implementing Universal Health Care... now... would be a total disaster. We are already headed for fiscal disaster few if any of you are prepared for, "free" Universal Health Care would just accelerate the process. Relieving our nation's employers and job creators of the expense of health insurance would stimulate the economy, don't you think? Much cheaper to hire new employees or raise their salaries when you're not also paying their medical bills. Driving the overall costs of medical procedures down will also mean that those portions of our entitlement programs dedicated to healthcare will become less expensive, while increasing the take-home pay of doctors-- because they're not the ones getting rich from the current system-- would ensure that the supply of doctors would increase. We could cut our per capita GDP expenditure on health care in half and still have better quality of care than anyone else on the planet. Then show me where there is such a thing as "Free Universal Health Care" no one is paying for. Do that before suggesting what I said was idiotic. Also, show me where you can implement "Free Universal Health Care" without taxing someone. And I believe that if you had read my posts subsequent to that, you would notice that I said that what we have today is not competition. What we have is a market ruled by entrenched interests that are thwarting the process of competition through government power. Please pay attention. Speaking of the food supply, that is an oft-overlooked component of our health-care problems. You are what you eat, after all, and there are a number of government subsidies for unhealthy foods. High-fructose corn syrup comes quickly to mind as an example. I don't think that we need government control of the food supply, per se . . . but I think a few regulations that enforce some higher standards would be appropriate and we should definitely get rid of any government support for anything that is unhealthy. The higher prices we pay for food would more than come back to us in the form of health-care savings. Call it "preventive care." I never said you could have "free" universal health care of any kind. I've always acknowledge that someone, and ideally everyone will have to pay for it. I've only ever said that we would all pay less for it if we all paid for it collectively instead of individually. The suggestion that we would have to pay for universal healthcare isn't idiotic. The suggestion that the price would be borne entirely by people who oppose universal healthcare is what's idiotic. So, you agree then that to implement "free Universal Health Care" every American's taxes should go up? (And I do mean everyone, no exceptions.) BTW, Obama would disagree with you as it is clear he only is interested in raising taxes on *some* Americans. imma not as well versed on this topic as Rude_Boy, but isn't thar some kinda trade off that happens (in this case, i mean a good trade-off). taxes might go up, but the cost that americans pay fer thar healthcare will go down, and go down more than taxes would go up, aye? if that be the case, wouldn't this be acceptable? I have no idea if that is really true or not (I suspect others do not as well,) but I would like to see the numbers on that as well as what is traded off to ensure costs go down. It is a justifiable concern since we are talking about government controls. But just because you and I say that may be a good trade off, does not mean we have considered everything in this complicated subject. What is compromised to ensure costs stay down? I voted no because of the word "Free". Universal health care, or single payer, is a payment system that is the best one around. Its health care results match those of the US but cost half as much. So maybe it's just semantics, but take the word "free" out and I'm with it because it makes the best business sense for everybody. Single payer or universal doesn't mean it's free. Everyone pays in with the taxes they pay both consumer and payroll. In America, for some inexplicable reason, people believe that you must have a private third-party person in the way who collects off of you and then sets the rules and governs your life. The average conservative in America is brainwashed into believing that a private, free market entity will somehow care about your health more than they care about profit. That's wrongheaded because a country needs healthy people so it can be productive. If you believe in liberty, than you must believe that "we the people" can negotiate the terms of our health care better than some private third-party entity that just keeps jacking up rates while offering nothing new or better. Under the current system in America, it's meant to eat every up. Everyone has to pay their share. So I can't go along with the OP's question on a technicality because it gives the appearance that health care would be free of charge, but it wouldn't be because every single day you wake up and go to work, you're earning your keep. With every purchase you make, you're throwing a little in to a pot. And it's all made affordable when you get rid of the useless private middle man who is meant to capitalize off of your bad health, a system that has destroyed millions of people and their families. Single-payer isn't perfect, but a national health service governed by "we the people" is just as effective and works out better for everyone since people with means won't have to help to cover people who don't have insurance anymore, since people would be automatically insured from birth. It's insanity to me that giving birth in America actually costs money, particularly in a country that plays like it really cares about every unborn life. From the taxes people pay both on the consumption and payroll sides, and from the laws that we the people could effectuate, women going into birth won't have to stress any longer about being in debt up to their ears because insurance wouldn't be a problem anymore. In my experience as one who lives at times in both Canada and America, I can say with certainty that the gov't (we the people) has never posed a problem to me accessing the health care system I contribute to in Canada, while in America I'm forced to call the insurer for every little thing. I don't know how Americans who live full-time in America can stand it. I enjoy real freedom, not the bamboozling of greedy people in the private market who wish to capitalize off of me being sick. The private payment system changes the entire philosophy from preventive care and medicine to a service that you need when you need it. That drives up costs for everyone. Put a poll where I can vote for universal, and I'll vote yes because it gives people more freedom and control over their own health care. Doctors live quite well in Canada, so take it from me, socialism isn't the enemy of all things. It actually works on some specific issues very well. Besides, socialism isn't the reason why America got all the problems it got this last decade, private greed did that. Just wait until it is "free" Universial Health Care. That's a nice scare tactic that represents nothing. Ask Michele Bachmann how she likes her universal health care for her and her large family. well...taxes may go up, i figure they might. still, 'tis a two part equation, and ye can't really discuss the merits 'o the taxes goin' up (if this in fact be the case) without measurin' the savings that americans will see on thar overall healthcare costs. regardin' the compromises...i am unsure what they might be. if, fer example, the Germans are sufferin' under thar system, i be unaware 'o it. I always have to laugh at you liberals, we now have a 15.5 trillion dollar national debt and rising by 1.5 trillion a yr. Yet you want FREE health care at the expense of raising our national debt from 1.5 trillion per yr to 2 trillion a yr. And you suggest to raise taxes, to cover free health care, yet we still borrow 1.5 trillion a yr to pay for the entitlements we already have and can't pay for. But as always you liberals think there is an endless supply of money. Based on the endless supply of money why not a free car every yr. or a new house every 3 yrs. Free babysitting for every American family that has a kid. I mean why not free everything, why would you stop at any one free thing you wanted, just make everything free. You liberals just can't get enough free stuff, why, because there is always an endless supply of money.